Psalm 46. 10 "Be still, and know that I am God; I will be exalted among the nations, I will be exalted in the earth." 11 The LORD Almighty is with us; the God of Jacob is our fortress. "Selah"
These familiar words from Psalm 46 have brought comfort to many believers over the years. I happened to mention them to one of my fellow leaders at Grace the other week whereupon he was quick to point out that the words are somewhat taken out of context, and as such are not a call for personal passivity and contemplation. So going to my trusty IVP commentary and the always pithy comments of Derek Kidner, I read..
Psalm 46.10, 11: The injunction Be still....is not in the first place comfort for the harassed but a rebuke to a restless and turbulent world: 'Quiet! '-in fact, 'Leave off!' 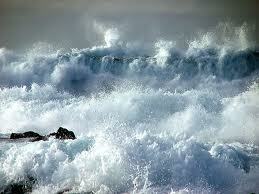 It resembles the command to another raging sea: 'Peace! Be still!' And the end in few is stated in terms not of man's hopes but of God's glory. His firm intention 'I will be exalted' is enough to arouse the resentment of the proud but the longing and resolve of the humble: 'Be exalted, O God above the heavens' (Ps 57.11). But also their renewed confidence. The refrain comes back with added force, if such a God is 'with us', and if one so exalted is 'our high stronghold' (NEB). Yikes...still God is generous and often blesses us when we unwittingly apply Biblical truth to our lives which, taken in their context, probably don't bear the weight of what we are thinking (you only have to read Spurgeon to realise this!! ).